Khalifa Industrial Zone Abu Dhabi (KIZAD), part of Abu Dhabi Ports, has reported a solid performance in 2016, completing yet another highly successful year for the facility that serves as the trade, logistics, and industrial hub of Abu Dhabi and the gateway to the world’s fastest-growing economies. The total value of KIZAD’s contribution to Abu Dhabi’s GDP accounted for 3.2% of the emirate’s non-oil GDP, reinforcing the industrial zone’s status as a key facilitator of economic diversification. 2016 also marked a year of important agreements and partnerships for KIZAD, which registered stable growth in leasing activity that resulted in 20 new standard Musataha agreements (SMAs) with local, regional, and international customers, increasing the total number of investors to over 130 to date. From the 130 investors, 88 investors have leased land through Musataha agreements, 21 invested in KZIAD’s Logistics Park, and 25 are free zone companies in different sectors. New investors in 2016 have each leased an average land size of 70,000 square metres, which brings the total areas leased in 2016 to more than two million square metres, increasing the total size of prime industrial leased areas since inception to 14.5 million square metres. KIZAD’s objectives are in line with the Abu Dhabi Economic Vision 2030 that aims to diversify the emirate’s economy away from hydrocarbon resources. Since its launch in November 2010, the industrial zone has attracted investments valued at over AED 55 billion across a variety of sectors. In 2016, KIZAD also achieved significant growth in its Emiratisation drive, which increased from 45% in Jan 2016 to 64% in Dec 2016. This demonstrates the importance placed by KIZAD on Emiratisation in line with the UAE’s national policy. 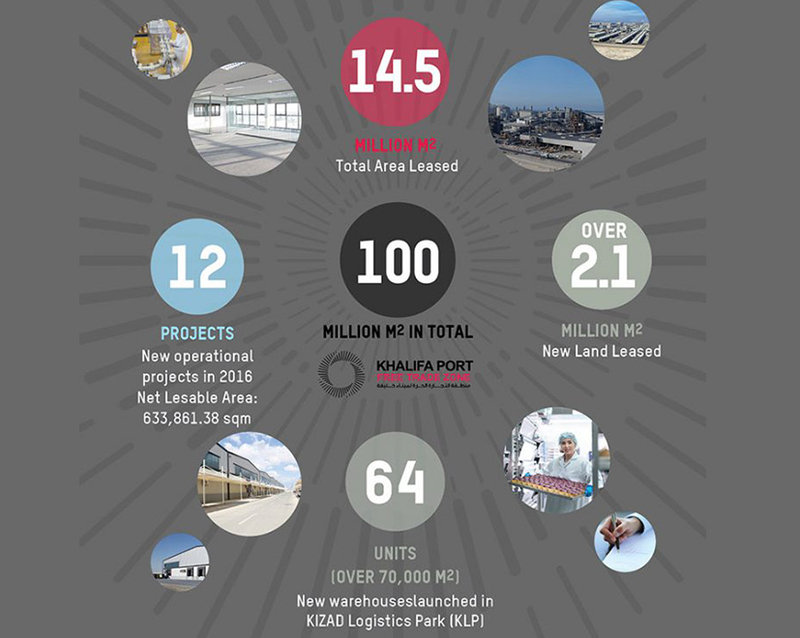 In response to the growing demand for more free zone space, KIZAD has added the new Khalifa Port Free Trade Zone (Khalifa Port FTZ) to its world-class infrastructure portfolio with a total free zone area of 100 square kilometres. The new free zone serves as a next-generation platform for trade, logistics, manufacturing, and consumer goods. Combining the legacy and success of KIZAD’s onshore structure with the traditional benefits of an offshore free zone, Khalifa Port FTZ promises to change the face of doing business in the region. Khalifa Port FTZ creates a wealth of opportunities for local, regional and international companies and investors. In addition to facilitating access to markets across the world, the free zone offers a competitive operating cost environment and a meticulously designed setting that makes doing business easier than ever before. Within the gross area of 100 square kilometres (across Areas A and B), Khalifa Port FTZ now boasts a wide portfolio of investment sectors including aluminium, automotive, engineered metals, port logistics, food processing, pharmaceuticals, packaging, polymer converting and other industries that rely on Khalifa Port. Khalifa Port FTZ offers a flexible master plan that is capable of accommodating more industries in the future from a land use perspective. Investors choosing the Khalifa Port FTZ are provided with an array of business set-up services that streamline their registration and licensing processes, while offering them access to dedicated desks and executive offices. The free zone caters for start-ups in trading and service sectors through executive offices and flexible workstations/dedicated desks, as a complementary offering to the overall value proposition of the industrial zone. The ultra-modern facility also provides unparalleled advantages for businesses including competitive lease prices and some of the lowest utility costs in the world – all under a tax-free umbrella. Through doing business in the free zone, investors can enjoy 100 per cent foreign ownership, 100 per cent repatriation of capital and profits, competitively priced shipments and efficient customs procedures, among other value-added benefits. Currently, the free zone is home to 8 logistic companies and 4 industrial companies. Industries in KIZAD continued to expand in 2016 with 20 new Standard Musataha Agreements (SMAs). This includes the SMA signed with Integral Plastic Industries Co. LLC in November 2016 to build a new manufacturing plant in Khalifa Industrial Zone (KIZAD) with an investment of AED 10 million. The manufacturing facility will be built on a plot of 21,649 square meters in KIZAD with the aim of producing 15,000 tons per annum of Plastic Bottles Preform (PET), Plastic Bottles Caps (HDPE), and Plastic Packing Strips Rolls (PET). Production is expected to commence in the first quarter of 2018. Abu Dhabi Ports also signed a 50-year Musataha Agreement with Emirates Aluminium Rolling (Emiroll), a joint venture between DUBAL Holding, Dubai Investment Industries (a subsidiary of Dubai Investments PJSC) and Madar Aluminum Rolling Singapore (MARS), to set up a manufacturing plant with a total investment of AED 440 million on a 83,554.58 square metre plot in KIZAD’s downstream aluminium cluster. Emirates Global Aluminium (EGA), an existing investor in KIZAD, will provide Emiroll with raw molten aluminium to produce aluminium rolled products, further boosting the UAE’s aluminium downstream industries to meet global demand and contribute to Abu Dhabi’s economic diversification plan. Meanwhile, ADNOC Distribution signed a Musataha agreement with Abu Dhabi Ports to strengthen ADNOC Distribution’s capacity to develop new projects at KIZAD and provide logistical support to its existing developments. As part of the agreement, ADNOC Distribution will set up a lubes and grease plant, as well as strategic storage warehouses to support product distribution operations in different emirates. The company will commence its operations in the new location by the beginning of 2022. Dolphin Energy signed a contract with Abu Dhabi Ports to accommodate hardware for its Emergency Pipeline Repair System (EPRS) at its new facility based in KIZAD. The AED 55 Million-facility will take shape on a 45,388 square metre-plot that will accommodate all EPRS hardware which will be housed, maintained and kept in a state of readiness in the event it is required. 2016 also marked the opening of a number of new facilities at KIZAD that sever a variety of strategic industrial sectors. In December 2016, Al Dahra Holding opened the Gulf region’s largest and only rice factory of its kind at KIZAD with a capacity to produce up to 120,000 metric tonnes of rice per annum. Spanning a total area of 100,106 square meters at KIZAD, the facility handles the full production cycle of rice that includes milling, storage, packaging as well as distribution within the UAE and exporting to foreign markets via the adjacent Khalifa Port. Al Masaood group along with its partner KSB AG of Germany – one of the world’s leading manufacturers of industrial pumps, valves, and related systems and services – opened their new facility in Abu Dhabi Ports’ Khalifa Industrial Zone Abu Dhabi (KIZAD) in February 2016. KSB’s new 12,141 sq. metre facility in KIZAD is their largest in the GCC region and one of their biggest from over 160 industrial service facilities across the globe. Its high production capacity will cater to KSB’s regional customers, offering services related to pumps, valves, gearboxes, speed converters, compressors and electro motors. In January 2016, Polysys Additive Technologies Middle East (PAT ME), Songwon Industrial Co. Ltd’s joint venture, commenced the operations of its state of the art manufacturing plant in KIZAD. The facility is dedicated to manufacturing One Pack Systems (OPS) − multicomponent, tailor made blends of additives in a pelletised form and then packaged in a clean, dust free environment, ready for shipping. With an initial capacity of 7’000 MT per annum, the manufacturing facility was specifically designed to allow for future expansion to meet the increasing demand for OPS products in the Middle East region and beyond. Some of the other prominent customers to have opened manufacturing facilities within the industrial zone in 2016 include SENAAT – TALEX, Emirates Investment Authority, Consolidated Contractors International Company, Oriental Fasteners, Technovaa Industries, and Al Seer Group. National Food Product Company (NFPC), one of the largest food producers in the UAE, launched construction activities of its new 752,000-sq metre production facility in KIZAD in February, 2016. The facility, which will manufacture most of NFPC brands, and is expected to start operations in the first quarter of 2018. In April 2016, Al Gharbia Pipe Company (“Al Gharbia”), a joint venture between Senaat and two of Japan’s leading companies in the steel sector; JFE Steel Corporation and Marubeni-Itochu Steel Inc. (“MISI”), started the construction of its new plant in KIZAD. To be built on a 200,000 square metres plot of land in KIZAD, the plant is expected to formally launch operations in 2018. Once fully operational, production capacity is set to reach 240,000 tonnes annually, of which around 40 per cent will be exported to neighbouring markets in the GCC and greater Middle East, as well as North and East Africa through Khalifa Port and the excellent road network that the UAE’s infrastructure provides. Gulf Printing and Packaging Company, a subsidiary of Al Khat Packaging Co., one of the largest producers of printing and packaging materials in Kuwait, commenced in February 2016 the construction of its new facility in KIZAD. The AED 80-million-facility in KIZAD will be Al Khat’s first production plant outside Kuwait. The factory will further expand the company’s manufacturing capacity to meet the requirements of various supply contracts covering the region. The increased business activities at KIZAD has mandated streamlining licensing and approval procedures at government departments and licensing authorities as part of its priority to provide customers with value-added solutions that enhanced their experience. This will allow businesses operating within KIZAD to save time and efforts while processing government transactions. Towards this end, Abu Dhabi Ports partnered with Abu Dhabi Chamber to establish a representative office of the Chamber at the Business Centre of Khalifa Industrial Zone (KIZAD) in Al Taweelah. The representative office will be dedicated to businesses operating within Khalifa Port and KIZAD, with a view to establishing direct communication channels between the Chamber and customers benefiting from its services. 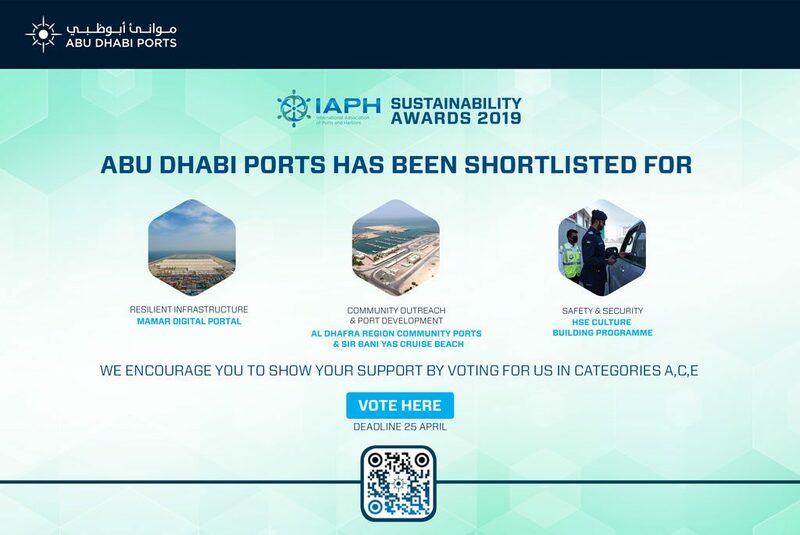 Abu Dhabi Ports also implemented an automated system at KIZAD, aimed at simplifying and expediting investor submissions of documents related to at least 20 different processes including licensing, planning, engineering, construction, operation, decommissioning, immigration and customs. Installed at the customer service and call centre of KIZAD, this back-end system alerts investors with the progress of their submissions through auto-generated emails. The system marks the first phase of a comprehensive automation drive at KIZAD that will, in its second phase, offer online services for investors through the KIZAD website. The high-standard automation, which is in line with best practices, aims to significantly improve KIZAD’s customer service. Abu Dhabi Ports also signed an agreement with Enjazat Services, a leading provider of value-added services in the emirate of Abu Dhabi, to set up dedicated service desks at KIZAD. The dedicated service desks will provide investors within KIZAD with end-to-end service related to licensing, residency permits, including labour visas, free zone employment visas, family visas, legal translation, legal consultancy, and additional third party specialised services for companies and investors. Location is key for business success and KIZAD is strategically located to offer customers access to major regional and international markets. Being a fundamental aspect to the logistics, storage and distribution industries, KZIAD’s strategic location has been leveraged with its world-class Logistics Park which provides tenants quick and efficient access to modern transport networks via road, sea, air, and rail linkages. KIZAD Logistics Park is comprised of pre-built and well-designed modular warehouse units. These units are equipped with easy access loading docks for your trucks, raised docked floor levels and clear open space for the eaves. The design also includes the shell and core scheme for setting up a mezzanine office. KLP has fully leased out its pre-built warehouses in Phase 1. In 2016, the company launched Phase 2 with 64 new units, across a total area of over 70,000 square meters, to meet growing demand in the market. Since the launch of KIZAD Logistics Park, KIZAD has signed agreements with Spinneys, the UAE’s leading retailer, Juma Airlink LLC, a leading provider of supply chain and logistics solutions, All Prints Distributor & Publishing, one of the main suppliers of educational materials and Hygienetech, specialised in professional distribution of commercial cleaning equipment and products. Another highly anticipated project in the year ahead is the construction of 35 free zone warehouses, as part of the Khalifa Port FTZ, with a total area of approximately 17,000 square metres. Comprising areas A and B that span 410 square kilometres, KIZAD’s value proposition combines outstanding access to markets with over 4.5 billion consumers connected via excellent sea, road, air and future rail transport networks. KIZAD offers a hybrid model of free-zone and non-free zone solutions complemented by dedicated investor support that simplifies the process of setting up businesses in Abu Dhabi. The offerings include flexible ownership rights, serviced land plots for logistics projects, dedicated desks and executive offices, in addition to quality finishings that reduce CAPEX/set-up costs. As a fully integrated and technology-enabled business platform, KIZAD acts as a catalyst for high-value supply chains, facilitating synergies and supporting expansion plans of companies seeking easy access to the world’s fastest-growing markets. It also increases the attractiveness of Abu Dhabi as a place to conduct fast, interconnected, and demand-led business through implementing innovative technologies and efficient processes. KIZAD’s strategically located Logistics Park provides logistics, storage and distribution industries with quick and efficient access to modern transport networks, such as the E11 Dubai / Abu Dhabi highway. The opening of the new Mohammed bin Rashid Road last November marked a major milestone in enabling Khalifa Port’s expansion and growth plans. Both manufacturers and exporters are gaining from reduced operational costs, significantly easing container traffic and reducing travelling time between the port and the rest of the country. The new road complements Khalifa Port’s plans to upgrade infrastructure and will enable it to handle some of the world’s largest ships and accommodate anticipated short to medium term growth in the industry. In August 2016, KIZAD received the first container of Morgan Advanced Materials (Morgan), a world leader in advanced materials, underscoring the streamlined, interconnected nature of the supply chain leading to and from KIZAD’s Free Zone. Abu Dhabi Ports ensured timely handling of the first shipment, which contained critical equipment for Morgan’s dedicated 37,000 sq meter advanced materials facility in KIZAD’s Free Zone, to support the company’s production activities. As the first container to a Free Zone company to be processed through Abu Dhabi Customs, several clearance procedures were put into practice for the first time. Through an initial 30-year Musataha agreement, Morgan has committed to an initial investment of AED 50 million (around £8.25 million) in their facility at KIZAD’s Free Zone. KIZAD is also supported by the adjacent Khalifa Port, one of the world’s fastest-growing ports with a semi-automated container terminal that handles all of Abu Dhabi’s container traffic. With a current capacity of 2.5 million TEUs (20-foot equivalent units/containers) and 12 million tonnes of general cargo, Khalifa Port plays a pivotal role in achieving economic diversification and enabling investors to maximise the potential of their businesses. Abu Dhabi Ports has recently announced a major expansion plan at Khalifa Port that will integrate 1,000 metres of quay wall and deepen its main channel and basin to 18 metres, adding an area of 600,000 square metres for cargo handling. Furthermore, a concession agreement to operate the new terminal at Khalifa Port, signed with Chinese shipping company COSCO in September 2016, will increase overall annual capacity to 6 million TEUs once all phases are complete.